When Jim Henson’s visionary fantasy masterpiece, Labyrinth was first released in 1986, it opened to mixed reviews. While most critics tended to praise its eye-opening visuals and sophisticated puppetry (what else could one expect from Jim Henson Productions? ), the majority of them didn’t seem to quite get it. They found it too crowded, too cluttered, too illogical. Over the years, however, audiences have come to discover and fall in love with the film, for many of the exact reasons that it was originally brushed aside. In my estimation, it’s one of the finest films of the 1980s, and a practically perfect example of dreampunk to kick off Zoetrope, our movie/TV review column. To me, what really lies at the heart of Labyrinth‘s genius is how freewheelingly imaginative it is. 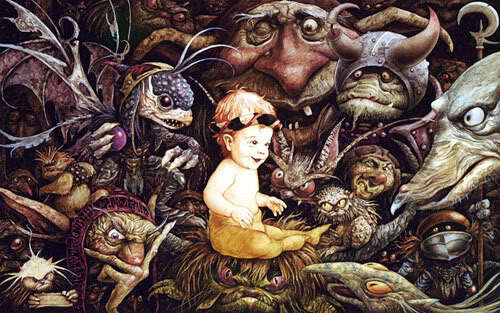 Inspired by the brilliant storybook illustrations of Brian Froud (Henson’s primary collaborator on the film), it seems to encompass every fairy story imaginable, with shades of Alice in Wonderland, The Wizard of Oz, George MacDonald’s The Princess and the Goblin, Cinderella, Snow White, other Brothers Grimm folktales, and everything in between. L. Frank Baum’s influence manifests itself in the oddball assortment of friends Sarah amasses as she wanders through the Goblin King, Jareth’s, labyrinth, though they seem even stranger than any of Baum’s creations, particularly Sir Didymus, a diminutive knight who is an amalgam of dog and fox. Meanwhile, the humor is often very Carrollian in nature (with a dash of Monty Python thrown in for good measure). Although the logic puzzle Sarah must solve to decide what door to choose actually derives from an early twentieth century mathematician, Raymond Smullyan, it is extremely reminiscent of something Carroll might have dreamed up, as are the linguistic traps that Sarah falls into as a result of not choosing exactly the right words, along with the at-times maddening characters, from the tiny worm who accidentally leads Sarah astray at the very start to the Fieries (the red, birdlike creatures with detachable heads) to the Wiseman with a bird growing out of his head. And all of these flights of fancy practically glow with rebellious energy. You can almost picture the devilish smile that must have lit up Henson and screenwriter Terry Jones’ faces when they came up with the cranky dwarf, Hoggle’s, first scene, in which he is poisoning a frollick of Victorian fairies with bug spray. And though Sarah initially takes pity on the creatures because they are as lovely to look at as those drawn by Arthur Rackham, she soon after learns just why Hoggle considers them pests, when one of them takes a bite out of her finger. That is just one of many examples of how Labyrinth takes tropes laid down in fairy stories from the 19th century and gleefully tweaks them. And though it never specifically confirms whether Sarah’s journey is actually a dream or not, the Labyrinth world is one based on dream logic, where clocks can have 13 numbers, where time can be sped up and slowed down at the whim of a malevolent goblin king, where the pathways of a maze can change and rearrange, where living statues installed as an alarm system can get personal satisfaction out of a job well done, where it makes complete sense that a knight on dogback would guard a bridge against anyone who doesn’t have his personal permission to cross it. And as I will demonstrate, Labyrinth is a dream unwittingly controlled by its dreamer. This all makes it a superb starting point for our dreampunk cinematic journey. Why, it even has elements of steampunk demonstrated not only in its Victorian influences, but specifically in the steam-powered, bronze, quasi-robotic creature that guards the city at the center of the labyrinth, controlled by a tiny goblin operator inside the head. 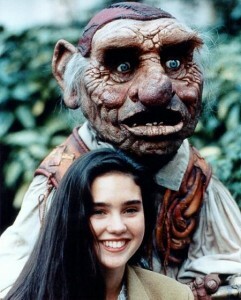 True, today, some of the effects look less than flawless, but overall, Labyrinth is still a marvel to watch, in large part due to how much Jim Henson, and his people were able to accomplish without CGI. The legendary MC Escher sequence is, of course, the most obvious example, but everything from the look of the labyrinth itself to the Junk Lady to the Bog of Eternal Stench to Ludo is pure, handcrafted magic. You look at the puppets and realize this was all done by human hands and with real materials. You look at the sparkling walls of the maze and realize that countless amounts of glitter had to actually be poured onto the set to create the effect. It gives the entire film an honest, tactile quality whose sheer invention and ingenuity more than make up for the need to suspend one’s disbelief at times. And then there are the costumes–the eye-popping, flamboyant, splendiferous costumes, from every bizarre and beautiful get-up David Bowie wears as Jareth to the gorgeous masquerade sequence, which I’m fairly certain had to have been a visual inspiration for Baz Luhrmann when he filmed Moulin Rouge. The slow-motion pan shots of the revelers at the start of the scene is strikingly similar to the shots used to establish the dancers and the atmosphere near the start of that film. the betting to accomplish an industry which is approximately “evens”. This article strongly warns against using these Chinese investor immigration agencies. they plainly don’t know about. You managed to hit the nail upon the top and defined out the whole thing without having side effect , people could take a signal.